living at 26 Millbank road, Richmond, Richmond County, New York. Passenger and Crew Lists of Vessels Arriving at New York, New York, 1897-1957, Washington, D.C.: Records of the Immigration and Naturalization Service; National Archives, , Year: 1943; ; Microfilm Serial: T715; Microfilm Roll: T715_6701; Line: 7; ; Page Number: 138. 1900 United States. Census Office. 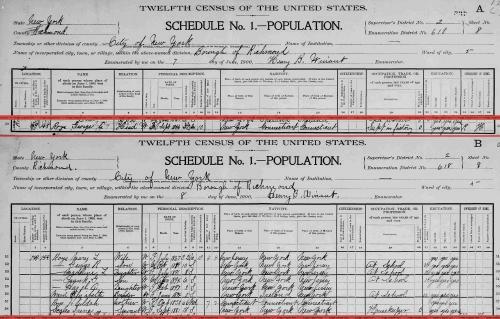 12th census, 1900 population census schedules, Washington, District of Columbia: Bureau of the Census Micro-Film Laboratory, ([197-]) , Census Place: Richmond Ward 5, Richmond, New York; Roll: T623 1154; Page: 8B; Enumeration District: 618. 1910 United States. Bureau of the Census. 13th census, 1910 population census schedules, Washington, District of Columbia: Bureau of Census Micro-Film Lab, ([19--?]) , Census Place: Bronx Assembly District 35, New York, New York; Roll: T624_1003; Page: 2A; Enumeration District: 1613; Image: 306; FHL microfilm: 1375016. Passenger and Crew Lists of Vessels Arriving at New York, New York, 1897-1957, Washington, D.C.: Records of the Immigration and Naturalization Service; National Archives, , Year: 1944; ; Microfilm Serial: T715; Microfilm Roll: T715_6790; Line: 1; ; Page Number: 23. State population census schedules, 1915, Albany, New York: New York State Archives, , Census Place: Election District 09, Assembly District 03, New York, Queens, 16. 1930 United States. Bureau of the Census. 15th census, United States, 1930 federal census : population schedules ; NARA microfilm publication T626, Washington, District of Columbia: Bureau of the Census Micro-Film Laboratory, ([19--?]) , Census Place: Jersey City, Hudson, New Jersey; Roll: 1355; Page: 5A; Enumeration District: 133; Image: 9.0; FHL microfilm: 2341090. Passenger and Crew Lists of Vessels Arriving at New York, New York, 1897-1957, Washington, D.C.: Records of the Immigration and Naturalization Service; National Archives, , Year: 1923; ; Microfilm Serial: T715; Microfilm Roll: T715_3286; Line: 3; ; Page Number: 197. Passenger and Crew Lists of Vessels Arriving at New York, New York, 1897-1957, Washington, D.C.: Records of the Immigration and Naturalization Service; National Archives, , Year: 1923; Arrival; Microfilm Serial: T715; Microfilm Roll: 3308; Line: 7; Page Number: 175. Passenger and Crew Lists of Vessels Arriving at New York, New York, 1897-1957, Washington, D.C.: Records of the Immigration and Naturalization Service; National Archives, , Year: 1923; ; Microfilm Serial: T715; Microfilm Roll: T715_3326; Line: 3; ; Page Number: 144. Passenger and Crew Lists of Vessels Arriving at New York, New York, 1897-1957, Washington, D.C.: Records of the Immigration and Naturalization Service; National Archives, , Year: 1923; ; Microfilm Serial: T715; Microfilm Roll: T715_3418; Line: 7; ; Page Number: 61. Passenger and Crew Lists of Vessels Arriving at New York, New York, 1897-1957, Washington, D.C.: Records of the Immigration and Naturalization Service; National Archives, , Year: 1947; ; Microfilm Serial: T715; Microfilm Roll: T715_7507; Line: 2; ; Page Number: 201. Passenger and Crew Lists of Vessels Arriving at New York, New York, 1897-1957, Washington, D.C.: Records of the Immigration and Naturalization Service; National Archives, , Year: 1924; Arrival; Microfilm Serial: T715; Microfilm Roll: 3452; Line: 4; Page Number: 130. Passenger and Crew Lists of Vessels Arriving at New York, New York, 1897-1957, Washington, D.C.: Records of the Immigration and Naturalization Service; National Archives, , Year: 1924; Arrival; Microfilm Serial: T715; Microfilm Roll: 3452; Line: 5; Page Number: 134. Passenger and Crew Lists of Vessels Arriving at New York, New York, 1897-1957, Washington, D.C.: Records of the Immigration and Naturalization Service; National Archives, , Year: 1924; Arrival; Microfilm Serial: T715; Microfilm Roll: 3464; Line: 4; Page Number: 79. Passenger and Crew Lists of Vessels Arriving at New York, New York, 1897-1957, Washington, D.C.: Records of the Immigration and Naturalization Service; National Archives, , Year: 1924; ; Microfilm Serial: T715; Microfilm Roll: T715_3478; Line: 4; ; Page Number: 123. Passenger and Crew Lists of Vessels Arriving at New York, New York, 1897-1957, Washington, D.C.: Records of the Immigration and Naturalization Service; National Archives, , Year: 1924; Arrival; Microfilm Serial: T715; Microfilm Roll: 3478; Line: 4; Page Number: 132. Passenger and Crew Lists of Vessels Arriving at New York, New York, 1897-1957, Washington, D.C.: Records of the Immigration and Naturalization Service; National Archives, , Year: 1924; Arrival; Microfilm Serial: T715; Microfilm Roll: 3507; Line: 5; Page Number: 123. Passenger and Crew Lists of Vessels Arriving at New York, New York, 1897-1957, Washington, D.C.: Records of the Immigration and Naturalization Service; National Archives, , Year: 1924; ; Microfilm Serial: T715; Microfilm Roll: T715_3519; Line: 5; ; Page Number: 215. Passenger and Crew Lists of Vessels Arriving at New York, New York, 1897-1957, Washington, D.C.: Records of the Immigration and Naturalization Service; National Archives, , Year: 1926; Arrival; Microfilm Serial: T715; Microfilm Roll: 3807; Line: 3; Page Number: 72. Passenger and Crew Lists of Vessels Arriving at New York, New York, 1897-1957, Washington, D.C.: Records of the Immigration and Naturalization Service; National Archives, , Year: 1926; ; Microfilm Serial: T715; Microfilm Roll: T715_3890; Line: 5; ; Page Number: 99. Passenger and Crew Lists of Vessels Arriving at New York, New York, 1897-1957, Washington, D.C.: Records of the Immigration and Naturalization Service; National Archives, , Year: 1926; Arrival; Microfilm Serial: T715; Microfilm Roll: 3922; Line: 6; Page Number: 109. Passenger and Crew Lists of Vessels Arriving at New York, New York, 1897-1957, Washington, D.C.: Records of the Immigration and Naturalization Service; National Archives, , Year: 1926; ; Microfilm Serial: T715; Microfilm Roll: T715_3925; Line: 5; ; Page Number: 44. Passenger and Crew Lists of Vessels Arriving at New York, New York, 1897-1957, Washington, D.C.: Records of the Immigration and Naturalization Service; National Archives, , Year: 1926; ; Microfilm Serial: T715; Microfilm Roll: T715_3945; Line: 7; ; Page Number: 157. Passenger and Crew Lists of Vessels Arriving at New York, New York, 1897-1957, Washington, D.C.: Records of the Immigration and Naturalization Service; National Archives, , Year: 1937; Arrival: New York, United States; Microfilm Serial: T715; Microfilm Roll: 5968; Line: 3; Page Number: 28. Sixteenth Census of the United States, 1940, Washington, D.C.: National Archives and Records Administration, (1940) , Census Place: New York, Richmond, New York; Roll: T627_2763; Page: 2A; Enumeration District: 43-200. Selective Service System United States, Selective Service Registration Cards, World War II: Fourth Registration, National Archives and Records Administration Region Branches, , New York > R > Rechten, William - Stark, Harry Joseph > 1355. Passenger and Crew Lists of Vessels Arriving at New York, New York, 1897-1957, Washington, D.C.: Records of the Immigration and Naturalization Service; National Archives, , Year: 1948; Arrival; Microfilm Serial: T715; Microfilm Roll: 7562; Line: 25; Page Number: 121. Passenger and Crew Lists of Vessels Arriving at New York, New York, 1897-1957, Washington, D.C.: Records of the Immigration and Naturalization Service; National Archives, , Year: 1948; Arrival; Microfilm Serial: T715; Microfilm Roll: 7592; Line: 5; Page Number: 143. Passenger and Crew Lists of Vessels Arriving at New York, New York, 1897-1957, Washington, D.C.: Records of the Immigration and Naturalization Service; National Archives, , Year: 1948; Arrival; Microfilm Serial: T715; Microfilm Roll: 7598; Line: 2; Page Number: 100. Passenger and Crew Lists of Vessels Arriving at New York, New York, 1897-1957, Washington, D.C.: Records of the Immigration and Naturalization Service; National Archives, , Year: 1948; Arrival; Microfilm Serial: T715; Microfilm Roll: 7604; Line: 2; Page Number: 24. Social Security Death Index, at http://www.ancestry.com/ssdi/advanced.htm, Number: 083-14-1849; Issue State: New York; Issue Date: Before 1951. He was the son of Harlow Roys and Huldah Griswold. living at Annadale Road, Richmond, Richmond County, New York. "New York, Marriages, 1686-1980," index, FamilySearch (https://familysearch.org/pal:/MM9.1.1/F6HX-BV3 : accessed 01 Dec 2012), George Augustus Roys and Marie Louise Rockefeller, 10 Jun 1889; citing reference , FHL microfilm 1558599. 1880 United States. Census Office. 10th census, 1880 federal population census, Washington, District of Columbia: National Archives and Records Service, ([19--]) , Census Place: New York (Manhattan), New York City-Greater, New York; Roll: T9_880; Family History Film: 1254880; Page: 96.1000; Enumeration District: 279; Image: 0133. The Trow (formerly Wilson's) Copartnership and Corporation Directory of the Bouroughs of Manhattan and the Bronx, City of New York, Trow Directory Printing and Bookbinding Co., (March, 1906) , p. 163. 1930 United States. Bureau of the Census. 15th census, United States, 1930 federal census : population schedules ; NARA microfilm publication T626, Washington, District of Columbia: Bureau of the Census Micro-Film Laboratory, ([19--?]) , Census Place: Jersey City, Hudson, New Jersey; Roll: 1354; Page: 2B; Enumeration District: 131; Image: 981.0; FHL microfilm: 2341089. Sixteenth Census of the United States, 1940, Washington, D.C.: National Archives and Records Administration, (1940) , Census Place: New York, Richmond, New York; Roll: T627_2763; Page: 1B; Enumeration District: 43-197.
living at 630 Bergin Ave., Jersey City, Hudson County, New Jersey. living at 343 Otis Ave., Staten Island, Richmond County, New York. World War I Draft Registration Cards, 1917-1918, at http://content.ancestry.com, Registration State: New York; Registration County: Queens; Roll: 1787168; Draft Board: 180. Selective Service System United States, Selective Service Registration Cards, World War II: Fourth Registration, National Archives and Records Administration Region Branches, , New York > R > Rechten, William - Stark, Harry Joseph > 1357, lists his birthdate as Oct 4, 1892. Passenger and Crew Lists of Vessels Arriving at New York, New York, 1897-1957, Washington, D.C.: Records of the Immigration and Naturalization Service; National Archives, , Year: 1943; Arrival; Microfilm Serial: T715; Microfilm Roll: 6711; Line: 10; Page Number: 93. Selective Service System United States, Selective Service Registration Cards, World War II: Fourth Registration, National Archives and Records Administration Region Branches, , New York > R > Rechten, William - Stark, Harry Joseph > 1357. He was the son of Augustus Roys and Lucy Smith. Harlow kept a country store in Norfolk, and was a stockholder in his brother's company. living at Brooklyn, Kings County, New York. Action against the Sheriff -- Validity of Bill of Sale. SUPERIOR COURT -- GENERAL TERM. This action was brought to recover possession of certain goods, taken by the Defendant, as Sheriff, in 1857. Plaintiff and appelant claims that in July, 1857, the firm of Duncan, Sprague & Brown was indebted to him for goods sold, cash lent, and his indorsements for them to the amount of $22,000. He occupied the same store with them, and was on terms of closest intimacy with the firm. 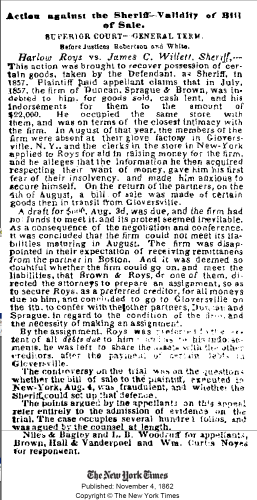 In August of that year, the members of the firm were absent at their glove factory in Gloversville, N.Y., and the clerks in the store in New York applied to Roys for aid in raising money for the firm, and he alleges that the information he then acquired respecting their want of money gave him his first fear of their insolvency, and made him anxious to secure himself. On the return of the partners on the 6th of August, a bill of sale was made of certain goods then in transit from Gloversville. A draft for $600, Aug. 3d, was due, and the firm had no funds to meet it, and its protest seemed inevitable. As a consequence of the negotiation and conference, it was concluded that the firm could not meet its liabilities maturing in August. The firm was disappointed in their expectation of receiving remittances from the partner in Boston. 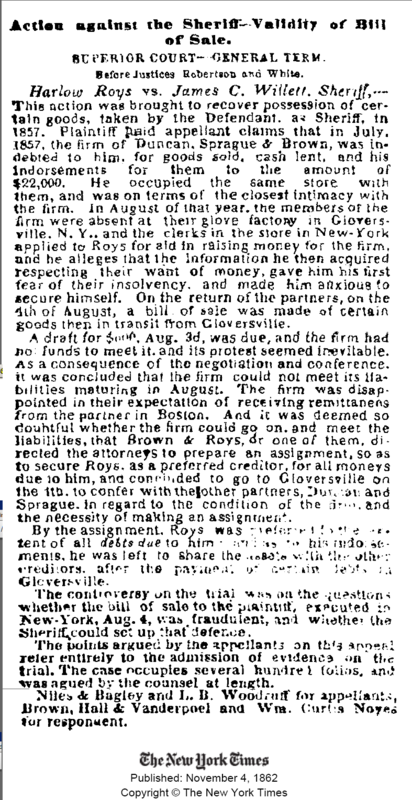 And it was deemed so doubtful whether the firm could go on, and meet the liabilities, that Brown & Roys, or one of them, directed the attorneys to prepare an assignment, so as to secure Roys, as a preferred creditor, for all moneys due to him, and concluded to go to Gloversville on the 11th to confer the other partners, Duncan and Sprague, in regard to the condition of the firm, and the necessity of making an assignment. By the assignment, Roys was qwiwq[illeg. ]qw/iwqtent of all debts due to him and as to his indorsements, he was left to share the assets with the other creditors, aster the payment of certain debts in Gloversville. The controversy on the trial was on the questions whether the bill of sale to the plaintiff, executed in New York, Aug. 4, was fraudulent, and whether the Sheriff could set up that defence. The points argued by the appellants on this appeal refer entirely to the admission of evidene on the trial. The case occupies several hundred folios, and was agued qwiwq[sic]qw/iwq by the counsel at length. Roys, Harlow. leather. house 40 Spruce. living at Newark, Essex County, New Jersey. 1840 United States. Census Office. 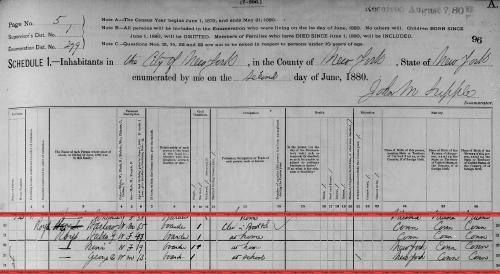 6th census, Census schedules, 1840, Washington, District of Columbia: National Archives. Central Plains Region,, (1938, 1950) , Census Place: Norfolk, Litchfield, Connecticut; Roll: 25; Page: 226; Image: 458; Family History Library Film: 0003020. Passenger and Crew Lists of Vessels Arriving at New York, New York, 1897-1957, Washington, D.C.: Records of the Immigration and Naturalization Service; National Archives, , Year: 1854; Arrival: New York , United States; Microfilm serial: M237; Microfilm roll: M237_142; Line: 14; List number: 912. Action against the Sheriff -- Validity of Bill of Sale., The New York Times, unknown location, 4 Nov 1862. Town and City Clerks of Massachusetts, Massachusetts Vital and Town Records, Provo, UT: Holbrook Research Institute (Jay and Delene Holbrook), , Boston > Deaths, 1882 > 165. Harvey Andrews Roys was born on May 25, 1826. "Connecticut, Deaths and Burials, 1772-1934," index, FamilySearch (https://familysearch.org/pal:/MM9.1.1/F7JN-22L : accessed 10 Dec 2012), Harvey A. Roys, 02 Jul 1840; citing reference 74, FHL microfilm 3354. "New York, Births and Christenings, 1640-1962," index, FamilySearch (https://familysearch.org/pal:/MM9.1.1/FDLX-MS8 : accessed 01 Dec 2012), G.A. Roys in entry for Hazel Roys, 12 Feb 1897; citing reference , FHL microfilm 1376368. Hiram Roys was born on April 20, 1795 in Norfolk, Connecticut. He was the son of James Roys and Olive Hinman. Hiram Roys was baptized on November 19, 1799 in Norfolk, Connecticut. Hiram married Lydia Andrews on January 27, 1820 in Norfolk, Connecticut. 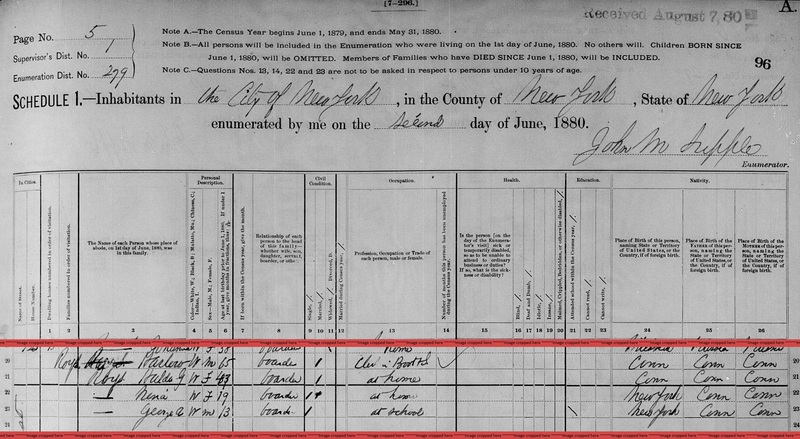 Hiram married Lucy Platt on March 10, 1847. Alvin Lee Rhods, The Royce Family in America, , at https://books.google.com/books?id=e-5OAAAAMAAJ . Madison, AL: (2005) , p. 224. Hiram Luther Roys was born on February 3, 1834. He was the son of Hiram Roys and Lydia Andrews. Norfolk (Conn.). Church of Christ, Baptisms, marriages, burials and list of members taken from church records of the Reverend Ammi Ruhamah Robbins, first minister of Norfolk, Connecticut, 1761-1813, Printed for C. and E. B. Stoeckel, (1910) , p. 39. "Massachusetts State Vital Records, 1841-1920," database with images, FamilySearch (https://familysearch.org/pal:/MM9.3.1/TH-1942-26446-34044-30?cc=1928860 : 20 May 2014), Deaths > Deaths 1920 vol 49 Gloucester-Great Barrington > image 507 of 516; State Archives, Boston. "Massachusetts Deaths, 1841-1915," database with images, FamilySearch (https://familysearch.org/ark:/61903/1:1:NWH5-PQ4 : 10 December 2014), Jack Roys, 13 Nov 1876; citing New Marlborough, Massachusetts, vol283 p51 cn28, State Archives, Boston; FHL microfilm 960,209. "Massachusetts Deaths, 1841-1915," database with images, FamilySearch (https://familysearch.org/pal:/MM9.3.1/TH-267-12390-26532-16?cc=1463156 : 20 May 2014), 2314527 (004283185) > image 2098 of 2245; State Archives, Boston. 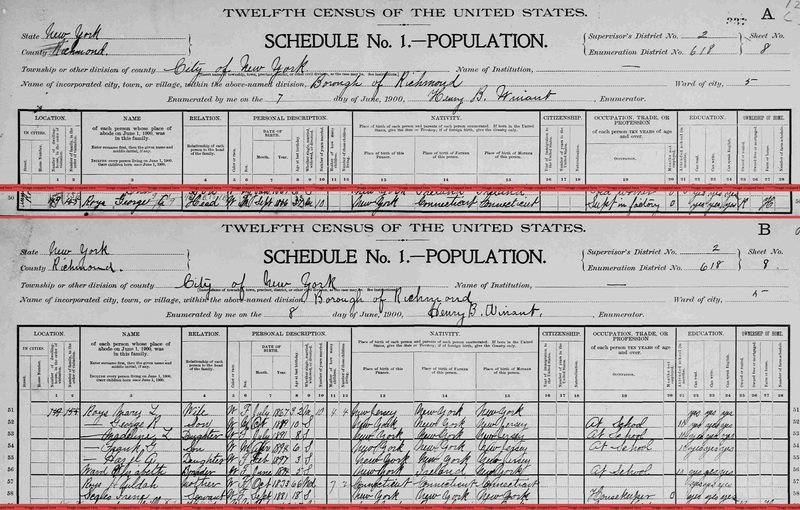 "United States Census, 1850," database with images, FamilySearch (https://familysearch.org/ark:/61903/1:1:MD9X-566 : 9 November 2014), Jack Roys, Sheffield, Berkshire, Massachusetts, United States; citing family 494, NARA microfilm publication M432 (Washington, D.C.: National Archives and Records Administration, n.d.). James Roys was baptized on October 27, 1779. James Roys was admitted to the at Church of Christ, Norfolk, Connecticut, on October 27, 1799. Alvin Lee Rhods, The Royce Family in America, , at https://books.google.com/books?id=e-5OAAAAMAAJ . Madison, AL: (2005) , p. 223. James Roys was buried in South Cemetery, Norfolk, Connecticut. Lorraine Cook White, The Barbour Collection of Connecticut Town Vital Records, Baltimore, MD, USA: Genealogical Publishing Co., (1994-2002) , Vol. 48, p. 369. Pane-Joyce Genealogy, at http://aleph0.clarku.edu/~djoyce/gen/report/, citing Donald L. Jacobus, Families of Ancient New Haven, 1922-1932, 3 volumes. Norfolk (Conn.). Church of Christ, Baptisms, marriages, burials and list of members taken from church records of the Reverend Ammi Ruhamah Robbins, first minister of Norfolk, Connecticut, 1761-1813, Printed for C. and E. B. Stoeckel, (1910) , p. 40. He was the son of John Roys. Norfolk (Conn.). Church of Christ, Baptisms, marriages, burials and list of members taken from church records of the Reverend Ammi Ruhamah Robbins, first minister of Norfolk, Connecticut, 1761-1813, Printed for C. and E. B. Stoeckel, (1910) , p. 80. Lorenzo Roys was born on October 17, 1823 in Norfolk, Connecticut. In 1857, Lorenzo Roys moved to Ohio. 1880 United States. Census Office. 10th census, 1880 federal population census, Washington, District of Columbia: National Archives and Records Service, ([19--]) , FHL Film 1254100; National Archives Film T9-0100; Page 150C.